Nate reunites with his Ate Sarah and Ninang Michelle! Ogie Alcasid's younger daughter Sarah arrives with mom Michelle van Eimeren from Australia in time for his 30th anniversary concert. Ogie will perform with all his kids—Leila, Sarah, and Nate—at his concert happening on Friday, August 24, at the Smart Araneta Coliseum. Ogie Alcasid's family is complete in Manila! The crooner's heart is happy that his younger daughter, Sarah Alcasid, has arrived safely in Manila with her mom, Michelle van Eimeren. Ogie and Regine Velasquez's son Nate welcomed his Ate Sarah and Ninang Michelle to their house with his Ate Leila, who is already based in the Philippines and is living with them. Last night, August 20, Ogie posted a video on Instagram of Regine and Nate in their home. Nate was asked by his mom to wait by their house's elevator, and jumped up and down as he saw it moving up. Picking up their pet shih tzu Chanel, Nate waited as the elevator doors opened to reveal his sisters and godmother. Sarah and Michelle came in time for Ogie's upcoming concert, OA: Ogie Alcasid 30th Aniversary Concert, happening this Friday, August 24, at the Araneta Coliseum. The three kids are all Ogie's special guests, and they will perform together onstage for the first time. Leila has already started her singing career here, while Sarah is part of her school's Glee Club back in Australia. As for Nate, it's no surprise the young boy loves music, since he has The Asia's Songbird and The Songwriter for his parents. "Si Nate, medyo alien yun, e, kaya isang pakinig lang niya alam na niya,” Ogie said in an earlier interview, referring to Nate's quick study of the song they will perform. 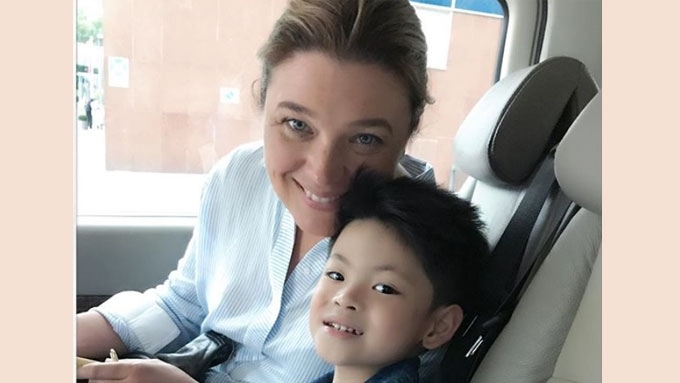 It's also the first time for Nate to meet his Ninang Michelle after learning that she used to be married to his Papa Ogie, a fact that he received well. Ogie said of his son, "Matalino yung bata, he’s very receptive."